I hope to upload Methodius On life and rational activity soon. The translation is done, and paid for (as of today), and only needs a tweak to my introductory footnote. Less good news: the Trinity-St Sergius Lavra site, which hosts the Old Slavonic manuscripts that we are using, is offline. Fortunately I did download the images of the two Methodius manuscripts so we are not completely stuck. I will pop them onto a keydrive and post them to the translator. This is a warning, tho, that these online collections of manuscripts are very fragile. In the case of most such sites, I wouldn’t even be able to download the images. I’ve seen the list of papers for the quadrennial Oxford Patristics Conference, 2015, which is due to start on 10th August. Invitations went out last year, and I looked at the price for the week, and I looked at the cost of staying in the accommodation (which you do want to do), and I thought about the financial loss involved in being away from work for a week. I also thought about the problem of car parking, which they make so difficult and expensive, and the lousy quality of the accommodation. And … I decided not to go. In truth I didn’t enjoy my conference all that much. Booking late, I ended up in a poor room in Queens College, which undoubtedly affected my mood rather. Having made that decision, I looked at the papers with some trepidation. Would it be full of items that I would ache to be present at? Things that I would really want to be present for? In fact, and I hate to say it, the papers look very dull. An awful lot of them seem to be by Americans, on the sort of topics that might be given to an undergraduate. So few of these papers looked interesting! I don’t know whether it is just me, or whether there is a genuine diminution in quality. The answer is probably a bit of both, in truth. There will be 900 people there. I’d like to mix with patristics people, it is true. But … I think I’ll be happier not to attend. Dioscorus’ letter to Shenoute is preserved in Coptic translation (from the original Greek, now lost) in four leaves of White Monastery Codex XZ. The first three of these were published by Herbert Thompson in his article “Dioscorus and Shenoute,” in Recueil d’études égyptologiques dédiées à la mémoire de Jean-François Champollion (BEHE 234; Paris: Librairie Ancienne Honoré Champion, 1922), 367–76. The last leaf was published by Henri Munier, Manuscrits coptes (CGAE 9201–9304; Cairo: Imprimerie de l’IFAO, 1916), 147–49. Thompson’s article contains an English translation of all four leaves. I use my own translation from the Coptic. The Thompson article is online at Gallica here. But better yet, if you download the PDF of the whole volume of the journal, you get a PDF which has been OCR’d, and bookmarks added to each article within it. That is new, and well done Gallica! I will scan and upload this text to the Fathers collection when I get a moment! By the way, if you are interested in the Gospel of Philip, I would like to direct you to my book, Images of Rebirth: Cognitive Poetics and Transformational Soteriology in the Gospel of Philip and the Exegesis on the Soul (Nag Hammadi and Manichaean Studies 73; Leiden: Brill, 2010), which contains a detailed analysis of this text. It may perhaps also interest you to know that starting January next year I have funding from the European Research Council for a five-year research project along the lines indicated in my Oxford paper – looking at the Nag Hammadi Codices and their texts in the context of fourth- and fifth-century Egyptian monasticism. I think this line of research must be promising, and will tell us a lot more about where the Nag Hammadi codices really appear from. UPDATE: The letter of Dioscorus to Shenoute, concerning the Origenist monk, is here. In my paper I referred specifically to Shenoute’s “I Am Amazed” and “Who Speaks Through the Prophet”. The best edition of “I Am Amazed” is now Hans-Joachim Cristea, Schenute von Atripe. Contra Origenistas: Edition des koptischen Textes mit annotierter Übersetzung und Indizes einschliesslich einer Übersetzung des 16. Osterfestbriefs des Theophilus in der Fassung des Hieronymus (ep. 96) (STAC 60; Tübingen: Mohr Siebeck, 2011). There’s an English translation of most of “I Am Amazed” in Michael Eugene Foat’s 1996 doctoral dissertation from Brown University, “I Myself Have Seen: The Representation of Humanity in the writings of apa Shenoute of Atripe.” It is not complete, however, as it is based on Tito Orlandi’s edition of the text. There are also English translations of excerpts from “I Am Amazed” in Stephen J. Davis, Coptic Christology in Practice: Incarnation and Divine Participation in Late Antique and Medieval Europe (Oxford Early Christian Studies; Oxford: Oxford University Press, 2008). By the way, I also treat “I Am Amazed” and other texts by Shenoute in the recently published article “Baptism in the Monasteries of Upper Egypt: The Pachomian Corpus and the Writings of Shenoute,” in Ablution, Initiation, and Baptism in Early Judaism, Graeco-Roman Religion, and Early Christianity (ed. David Hellholm et al. ; 3 vols. ; BZNW 176; Berlin: Walter de Gruyter, 2011), 1347-80, as well as in several forthcoming articles. As for “Who Speaks Through the Prophet”, it has not been edited and no reliable English translation exists. I rely on photographs of the manuscript evidence. I have my own working edition of “Who Speaks Through the Prophet”, but since an international editorial team lead by Professor Stephen Emmel at the University Münster is currently hard at work editing the entire Shenoutean corpus there should be no need for me to publish an edition of it. I might publish a translation of it though. We’ll see. I will set up a website dedicated to my project in the not too distant future. This is all very useful. I confess that I’ve never had that clear an idea of what existed by Shenoute, but I shall look at this with more interest. UPDATE: A Google search reveals that the new German edition of “I am amazed” — Contra Origenistas — runs to 387 pages, and includes the Coptic text and a German edition, as well as the Letter of Theophilus included in the treatise, which was also preserved in a Latin translation by Jerome. Apparently comparison of the two version is interesting! I forgot to mention that at breakfast I found myself in the queue, and talking to a chap who, like myself, wasn’t wearing his name badge (the name badges this year were excellently readable). It turned out to be Mark DelCogliano, who has translated a number of the prefaces to books of the Vulgate and also done an academic translation of Eusebius, De Pascha for a volume of papers which has just appeared and which I need to get and read. Currently he is doing a translation of some of the homilies of Gregory the Great Basil of Caesarea for the St. Vladimir Press, and most of those homilies have never been translated before. It was great to meet him. The system of having meals together is a very important part of the conference, and was the main reason why I endured the discomfort of Queen’s College Annex. After that, I checked out of my room and took my luggage to the lodge. Curiously their locked room for heavy luggage is down two flights of narrow stairs! Someone at Queens needs to think about that, just a bit. 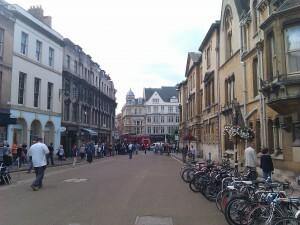 Then I wandered off into Oxford. Today it was damp and hot, but overcast, and there were few people around. It was around 9am. I walked down to the Eastgate Hotel and verified the presence of a usable-size car park there, for future reference. The rack rates were extortionate, but the staff as good as told me that they were all negotiable. Doubtless in reality you book through some agent and pay 50% of it. 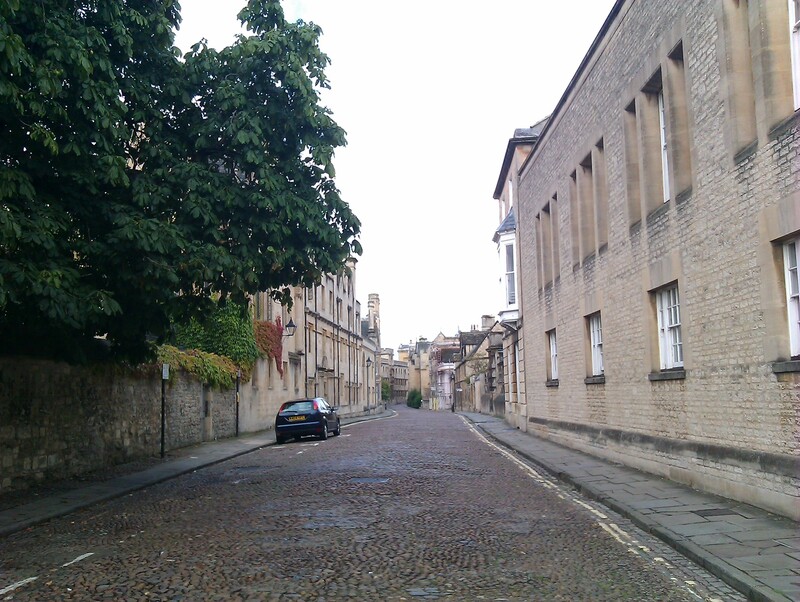 Then I walked along Merton Street — such a contrast to the noisy High Street. I walked through my old college, Merton, to the gardens, out to the turret on the wall where Tolkien used to sit, and where I remember that we once held a bible study on a sunny day. Then down to the Rose Lane Annex, looking unchanged, and then to Grove and out again. The college grounds were immaculate, and I reflected again on how lucky I was to have spent four happy years there. Alas! The ranks of the Grecians of my time may stand still, yet we are not what we were. Some have been shaken or defeated by the shock of the years, or unexpected illness, and all of us, I fear, have had to give up the ambitions of youth in the daily effort to make a living. Few were wealthy or well-connected, and most had no real idea of what to do next. Many have ended up in dead-end jobs such as computer programming, wondering what happened, and even unable to marry for lack of suitable people whom men of intelligence and humour could sensibly marry. “Is this all there is?” some ask, wondering what meaning their life has. Alas, for such is the lot of men. I have been very fortunate to be able to return to Oxford at a conference such as this, where everyone is friendly, a smile will be returned, and everyone you meet will be doing something interesting, and be able to tell you about it and to hear about your own work. It is always the people that make the place. Indeed, once the conference was over, I was just a solitary man again wandering around a strange town. I walked down to the river, and then back up St Aldates, along Cornmarket, to the Ashmolean Museum. I had heard good things of this last night. Blessedly, admission is free. Even more blessedly, they allow photography, so long as you don’t use flash. My mobile phone has a 5mp camera in it. 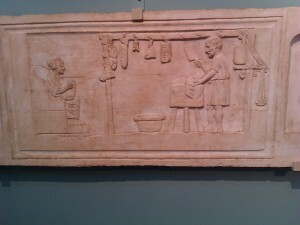 Most interesting of the exhibits was a block of stone labelled the “Parian Marble”. As you can see from the photograph, the script on it is barely visible. 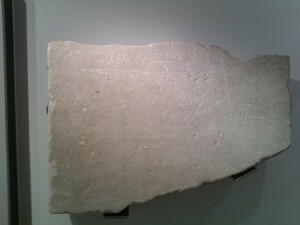 Yet it is, in fact, a Greek chronology, and the oldest known, according to the note on display. The earliest entries are mythical, but it would be interesting to compare this with Eusebius’ Chronicle. 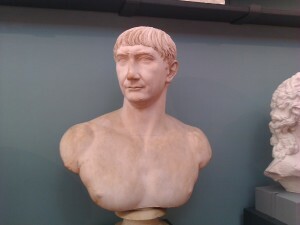 A very dramatic bust of Trajan was present, in the form of a cast. Another couple of items, also casts, caught my eye. 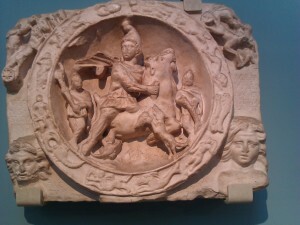 The first was a tauroctony — quite a small one, cast from an item in the Museum of London, and dated to the third century AD. 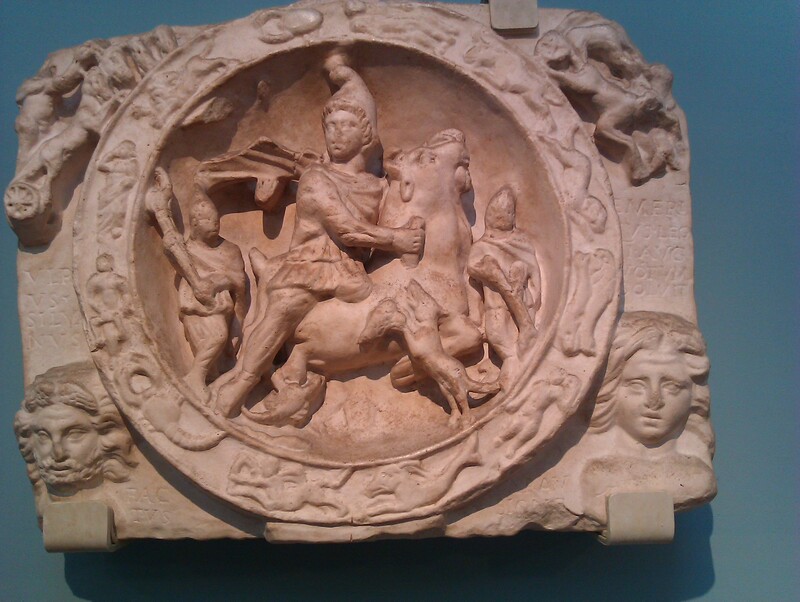 Mithras is surrounded by the zodiac. Top left is the sun, top right is the moon, while two of the winds fill the lower corners. The writing indicates that it was dedicated in fulfilment of a vow by a veteran named Ulpius Silvanus, who became an initiate at Arausio (modern Orange). 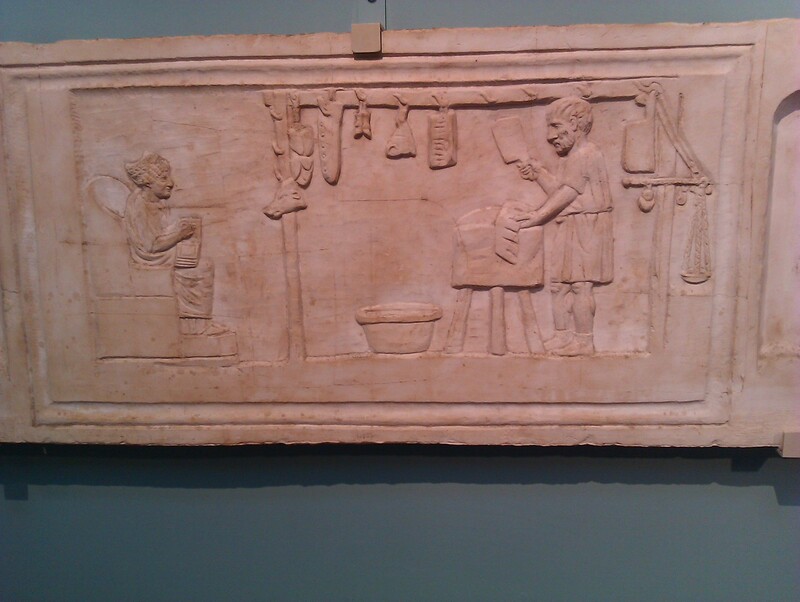 Butcher and wife, 125-150 AD, with codex. 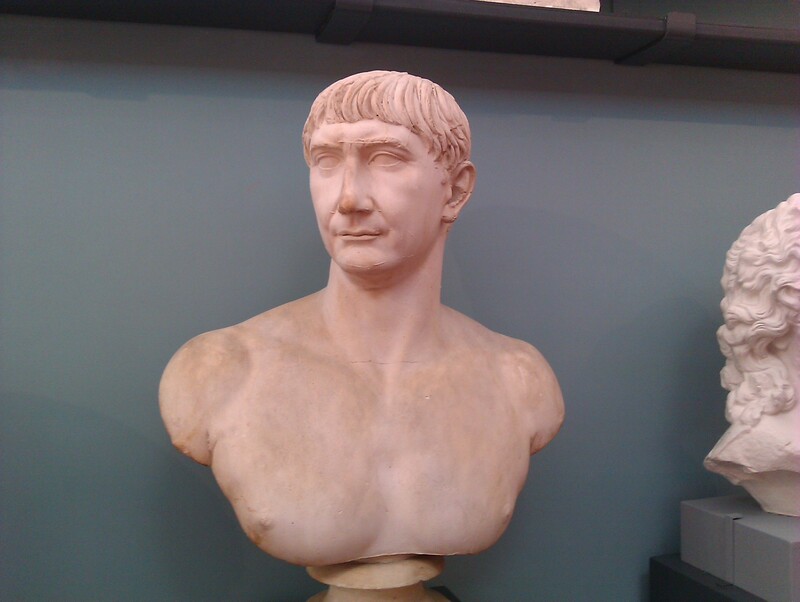 Ashmolean cast. I’ll include a close-up of the book. I had read that businessmen in the early Principate used notebooks made of papyrus leaves, but this is the first example I had seen. But this might also be an example of a wooden codex with wax pages, that could be reused. You can click on any of these images to get a full size image. After that, I quickly tired of walking around alone, and made my way back to the college. I retrieved it, and got them to call a taxi (A1 Taxis, 01865-248-000), which turned out to be a real taxi rather than a minicab and which whisked me quite cheaply back to where I had left my car. And then, dear reader, I drove home. What a week it has been! It was with great trepidation and stomach cramps that I set out on Wednesday. The cramps, I suspect, were really caused by the stress of getting ill when I wanted to be in Oxford. 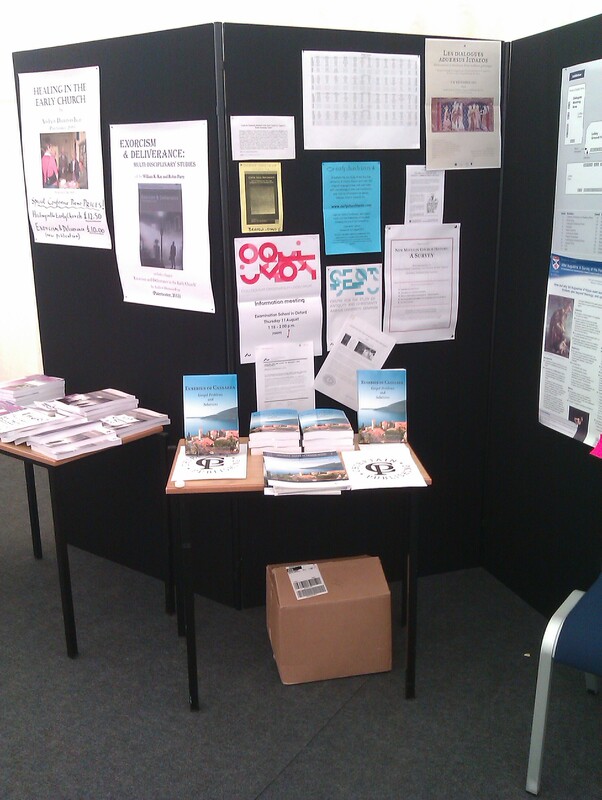 Then the difficulties on arrival and with the accomodation, and the stress of setting up the stall and so forth. But it has been tremendous. I have enjoyed being here, and would not have missed it for the world. The papers were, if anything, rather better than last time. The presence of graduate students with a need to impress — to find posts — meant that even these had made a considerable effort. I’ve grumbled quite a bit about some of the admin things, not least because they are hard on a man who is not that well, and not that young any more. But these must be taken in perspective, and much of the organisation was actually rather better than in previous conferences. The conference itself is the thing, and it is a great joy to attend. To leave is like leaving home. I’m looking forward to Exeter next year. UPDATE: Fixed description of what Mark DelCogliano is working on. Up with the lark, and off to breakfast at 7:45. A queue of disappointed people outside, tho, because it turns out that on Saturday it’s at 8:15. It’s another warm day, and is raining slightly. I’m going to leave my bags in the porter’s lodge for an hour or two and wander around Oxford! I spent the evening trying to get the Kindle application to install on my mobile phone, and enduring various obstacles and difficulties. At 8:30pm there was a session at the university church of St. Mary the Virgin, and I was eventually obliged to leave my phone downloading that application, pop it in my pocket, and head off to the church. I admit that I was not terribly enthusiastic about this, but in fact the subject was really “Did the Fathers use the Socratic dialogue, and if not, how dialogue-like were their disputations”. This was much more interesting, and I listened with increasing interest as she went on. It contained quite a number of references to interesting-sounding texts. I chuckled when I heard a reference to the Dialogue with a Persian of the emperor Manuel II Comnenus, right at the end of the Byzantine period, when Manuel was obliged to winter at Ankara as a vassal of the Ottoman sultan. This was the text that Pope Benedict quoted to show that Moslems were violent, and which was refuted by riots across the Moslem world. I think I translated some of this and put it online; but a proper English translation of the work has never appeared. Another reference was to a dialogue at the court of Justinian between Paul the Persian and a Manichaean. (1) I have always been interested in Paul, as a truly obscure figure, ever since I came across his name while looking at Severus Sebokht. I need to find out more about this. There were also references to disputations in the Sassanid empire with Zoroastrians. One of these was apparently translated by someone called Walker and was entitled the History of some-odd-sounding-name. I tried to use my mobile to access Google and look this up, but in vain. A third reference was to a 6th century dialogue with an iatrosophist — i.e. a medical philosopher — in Alexandria. Again I need to do that Google search. The session ended with a presentation of something to the speaker, and of flowers to Gillian Clark who organised the whole conference and indeed had produced what to my eyes was the best conference yet. Afterwards people started talking, and indeed as I tried to leave the church, I was surrounded by scenes of frantic networking, and quite right too. Immediately in front of me was a chap whose name-badge read “Aaron Johnson”, and I heard the word “Porphyry” uttered. Aaron does work on Eusebius, but is an offline person (and probably gets more scholarly work done accordingly). There was something of a queue to talk to him, and in the street outside knots of people formed. I did get to speak to him, and we talked about his translation of Eusebius Eclogae Propheticae, which is not published but he hopes to use with students in the next year; likewise the Commentary on Luke by Eusebius. We also discussed the Eusebius, Commentary on the Psalms, on which he has written a couple of articles that are probably in JSTOR and which I need to read. I accidentally commissioned a translation of the portion on Ps. 51 and found it very boring, but he told me that there was valuable material in there on issues like attitudes to race in late antiquity. I must look at the work again, and form an idea of what there is in it sometime. I then got a chance to talk to Gillian Clark, who really made my Eusebius book possible, and got a copy of it, not from me, but from David Miller, the main translator. I grovelled suitably that I had not sent her one of the first complimentary copies. In truth I have still not sent out all the copies that honour demands, such has been the pressure, but that was a very bad slip on my part, due entirely to accident. But she was very good about it, as she always is. Quite how she manages to find the time to edit texts in the TTH series, run conferences, and do academic work, while encouraging everyone she interacts with I do not know! I then found myself stood next to a very nice American girl, a scholar of art, who turned out to be associated with Brigham Young University in Utah. That institution brought to mind the name of Kristian Heal, who is doing such good work in copying Arabic manuscripts and making Syriac texts available. I learned that he has now established copies of his microfilm collection of Arabic mss. in various European locations. The set in England is in Oxford, at the Oriental Institute, or, more accurately, in a box under David G. Taylor’s desk there! There is a set at the Institut de recherches et histoire de textes in Paris, and another at the Pontifical University in Rome, and a couple of other places which I do not recall. Apparently the grant money received for getting these had conditions that mean it is all open source! After that, back here, and to compose emails! And now, since it is 00:43, I’m going to bed! 1. This is the Debate of Photinus the Manichaean and Paul the Persian, (PG 88, 529-552). See Byard Bennett’s article here for more details of the manuscript tradition and publication by Angelo Mai. Two English translations are in preparation. 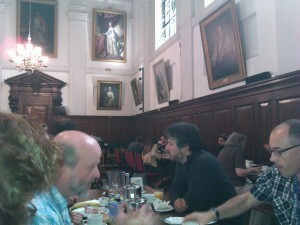 I made to breakfast this morning in Queens College. This is from 7:45-8:45. 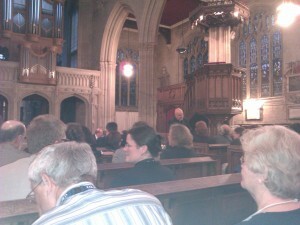 Rather foolishly I presumed that no-one would be there at 7:45, and arrived just after 8. I had difficulty getting seated! Then off to the Examination Schools, and into the South School, an immense area with a handful of people. But the lecturer did not turn up, so I ended up wandering into the exhibition area and chatting to George Kiraz of Gorgias Press about the vagiaries of large corporations, for whom both of us have worked at one time or another. Then off to Room 1, to the George Bevan Interpolations in the Syriac translation of Nestorius’ Liber Heraclidis. I arrived just in time to catch the end of the preceding paper by Ken Parry, Rejoice for me, O desert: fresh light on the remains of Nestorius in Egypt. It seems that he has discovered a local tradition in the Kharga oasis in the western desert that this is where Nestorius was exiled, which identifies some church there as the “church of Nestorius”. I wish I had heard this paper. The Bevan paper addressed allegations of large scale interpolation in the Bazaar of Heracleides, Nestorius’ defence of himself, which is preserved only in a Syriac translation which survived to 1843 in the Nestorian patriarchal library at Kotchanes in Persia, when the place was sacked by the Kurds, and the ms. was damaged. Dr Bevan showed that the allegations are mostly unfounded. It seems that, according to Evagrius Scholasticus, Nestorius was invited to defend himself at the Council of Chalcedon in 451, but died before he could attend. I suspect that, had he been able to attend, the Nestorian schism would have been healed, for Nestorius approved of the Tome of Pope Leo, sent to that conference and approved by it. The paper also discussed a confusing passage in which Nestorius describes how Cyril bribed the emperor, and the emperor then demanded a further 2,000 pounds of gold in bribe money, believing there was more to be got out of the Alexandrian leader. We’re all familiar with letter 91 in the letters of Cyril of Alexandria, which consists of a list of bribes to be paid at Constantinople. Such was the decay in the politics of the Eastern Empire. Finally Dr. B. pointed out that a chunk of pages that clearly don’t belong may instead belong to another now lost work of Nestorius, and hypothesised that a copy also existed at Kotchanes, and was destroyed by the Moslems in 1843, leaving only a few leaves which someone stuffed into the manuscript of the Bazaar. It could be so. I followed Dr. Erica Hunter into the North school book exhibition – who taught me what Syriac I know, and helped with the Eusebius project – and she introduced me to Majella Franzmann of Curtin University in Australia, who has discovered Syriac gravestones in China. I talk to a lonely-looking lady manning one of the stalls, and ask her how business is. It’s the same for her as for me – people come and look, and pick up flyers, but they don’t buy many copies. What I should have done, I think, is produce a freebie extract of a dozen pages or so and include it in the conference pack or give it away at the stall. Then on to hear Charles Hill at 10am, talking about ‘The scripture that says’: the status of the Shepherd of Hermas in the writings of Irenaeus. This was an interesting and convincing analysis of the passages in which Irenaeus talks about “graphe” or “scriptura”. He concluded that Irenaeus only uses one passage from the Shepherd, and always uses words that he also uses to refer to Justin and other non-scriptural works. I had to sprint out of there, and across to my room to collect the laptop. Then down to the marquee at 10:20, to mind the stall. This has been a social experience (it is now 11:54), as a series of people arrived here. So I have been typing this almost the whole time! 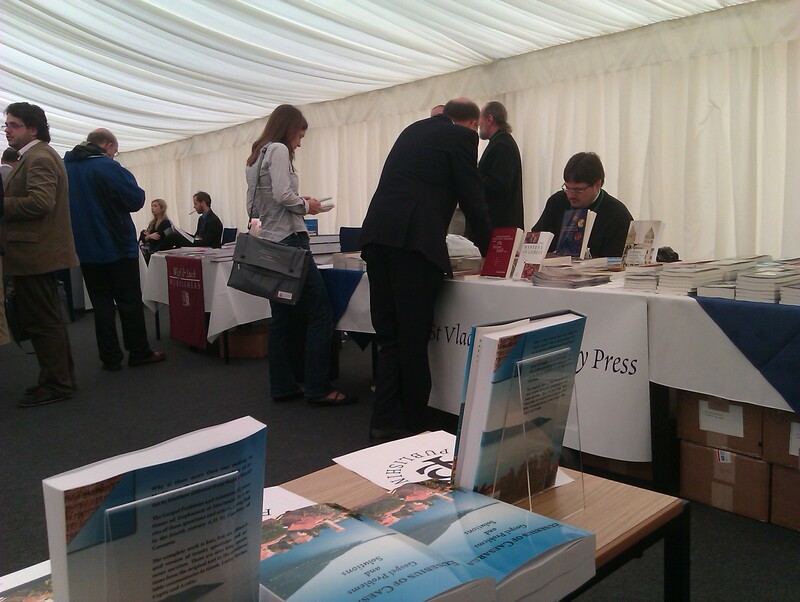 First to arrive at the stand was Michael Glerup of the Centre for early African Christianity. His interest is getting patristic texts into the hands of Christians in black Africa. But he also is interested in Ethiopian texts, and so in Arabic texts. He knows about the translation of Severian of Gabala on the Creation, which is being published by IVP. It sounds as if he is involved in that set of translations. I offer to help with Arabic Christian stuff. I also impressed on him the real need in Arabic Christian studies, which is for a single volume handbook of Arabic Christian literature, with a limited biblio of editions and translations and studies, Quasten style. This alone would revolutionise the field by making it more accessible. Next was Clayton Coombs, who delivered a paper on Eusebius ad Marinum. We’re going out to the Kings Arms at 3pm for a drink. Next Erica Hunter appeared again, and we had a long discussion about matters connected with Syriac and the Turfan find of Syriac manuscript (many of which are Christian, rather than Manichaean). I also sold two copies of the hardback of the Eusebius book, and quite a few people expressed interest. Christophe Guignard, who was also giving a paper, and was a friend of Claudio Zamagni – whose Greek text I used for the Eusebius book, but had been unable to get a place for the conference, having left it too late – came along and told me about his own edition of the fragments of the Letter of Julius Africanus to Aristides – quoted in my Eusebius book – where he had discovered a further portion of unpublished material by Africanus in the catena of Nicetas, under the name of Gregory. This catena is important, yet it remains unpublished; and this failure to publish it is a scandal. Christophe mentioned that to edit it would probably be a 20 year task, yet without security of tenure, who could start on such an undertaking. He had worked from an image of the manuscript. There is a case, I suppose, for simply printing the manuscript with a translation, to kick things off. Along comes Morwenna Ludlow of Exeter University, and hands me a poster for the British Patristics Conference in 2012 (5-7th Sept). Mailing list for it is britishpatristics@gmail.com. I impress on her the importance of car parking. 12:17 David Greenwood looks in, and reminds me that we corresponded about R. Joseph Hoffmann some time back. He turns out to be a Christian too, and went to the Wycliffe thing and left during the break so didn’t get the revealing question and answer session. I clue him in on that. 12:24 As I sit here, someone else comes to the stall and I talk to them about the works of Augustine. Everyone seems to admire the cover of the book. Well it’s nearly 12:30, and I’m well over my time. The marquee has emptied, and I think I shall take the main box of books back to my room, since I doubt I will sell many more. And I would really like to upload all this! In the afternoon I bunked off. I really did. There were three sessions on Chrysostom in Syriac, but I looked at the abstracts and the urge to go waned. The sunshine called to me, and I went out instead. 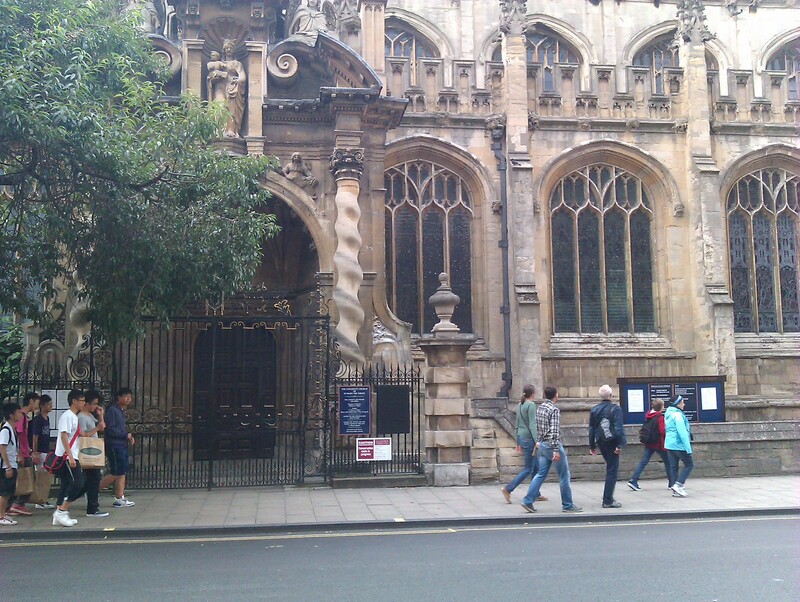 First I walked up to the Bodleian Library, and dropped into the admissions office. My pass had expired, so I renewed it. In the process I learned that the manuscripts and rare books department had been kicked out of Duke Humphrey’s library and were squatting in a basement room in the Radcliffe Science Library. The phrase “seated three to a chair” was used. Apparently the New Library building is to be demolished, and a brand new building constructed by 2015, in which “special collections” will be based. The fate of the historic Duke Humphrey’s is unknown. I heard all this with some scepticism. The problem at the Bodleian has always been that not enough material is available on the shelves, and ordering material from the stack takes ages. I do hope that all this work is not merely in order to improve the working conditions of the staff — which it seems certain to do –, but also improves the usefulness of the library to the readers. Then out, and along Broad Street. The sun poured down and there were few cars and people walking in the road. Blackwell’s bookshop is still there, but I didn’t go in. So was Balliol College, of which we used to say, “C’est manifique, mais c’est n’est pas la gare”, parodying the observation of a French officer during the Crimean War on the Charge of the Light Brigade. But it differed from my day in a couple of respects. 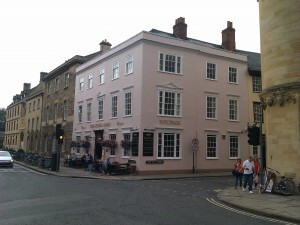 For instance, Thornton’s bookshop was gone, replaced by … some nothing shop. I made my way up to the Tesco Metro, which was killing the nearby Sainsburys. There I bought a couple of rolls, evidently fresh, came out and started walking down towards the station. I passed the market at Gloucester Green, which I never remember visiting in my student days, full of tatty stalls under striped awnings. A shop selling Italian bread and with dried hams hanging up was nearby. I was on my way to Oxbow books, in 10 Hythe Bridge Street. Ahead of me, some blonde dolly bird was walking, evidently sightseeing, and eventually stopped to photograph the river. The street itself was rather industrial, and Oxbow books occupied what looked like a converted office, up a metal stair. There I bought the TTH translation of Hilary of Poitiers for less than £5, but nothing else. 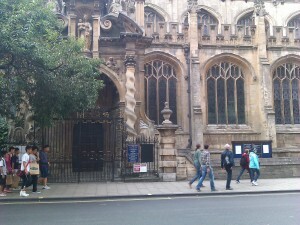 Then back, sauntering in the sun, until I reached the Examination Schools where the conference is being held. I had decided to attend one of the 4pm workshops, and hear the first paper, on the Pistis Sophia and astrology. The links between ancient astrology and gnostic texts seem like a worthwhile idea to explore to me. 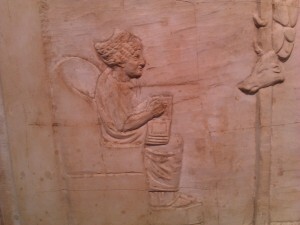 But the talk was incredibly technical, and required a lot of knowledge of both text and astrological jargon. There was a lot of noise from outside as well. After 10 minutes I gave myself mercy and slipped out. Then over to the marquee, and I sat at my stall for a while, working out what to do next. But as I did so, Carol Downer came by. Carol translated the Coptic for the Eusebius book. It was nice to meet her for the first time. The next step was to go to a meeting of Evangelicals involved in Patristics (5:30-7). This was taking place at Wycliffe Hall, at 58 Banbury Road, which is quite a step! But I walked up there, passing the science labs in South Parks Road — where Cromwell once parked his cannon during the siege of Oxford, and the revetments used to be visible. 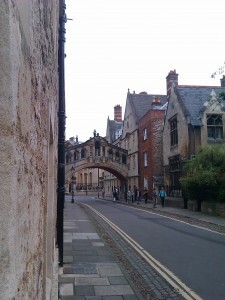 As a student I walked this route to lectures regularly. There was a large turnout for the meeting, and rather too small a room. Four speakers each said something about evangelicalism and patristics, mostly from an American point of view. But as I listened, I began to become somewhat uneasy. What I was hearing was, if anything, putting evangelicalism down. If the word “evangelical” means anything, it means a bible-believing Christian, who has met Jesus and decided to make Him the Lord in his life and bases his life on the bible — that which the Lord taught, the apostles preached, and the scripture records, without the sort of additions that Catholics and Orthodox make, and certainly without the wishy-washyness of the liberal, who is always “progressing” and “enriching” and stuff like that, and whom Tertullian aptly describes in De praescriptione haereticorum. But the panelists, one and all, spoke as if evangelicalism was something to get away from, something that was only one part of the church, where people needed to learn about the “richness of other traditions”, and they saw patristics as a way to induce evangelicals to do this. Lots of questions came from people boasting about how they were managing to get evangelicals to do this, by one method or another. Questions were asked for, and I put my hand up. I pointed out that in Oxford 2 centuries a young evangelical started studying the fathers, and his name was John Henry Newman; and asked them what they thought the dangers were in evangelicals studying the fathers. Newman and his colleagues, of course, all abandoned the faith of their youth and most ended up as Catholics or Ritualists. But the panelists saw no problem, no danger. Indeed their responses indicated that they thought that evangelicals “enriching” (i.e. changing, for the word means nothing else) their faith was a good thing. In other words, these people were not evangelicals at all, but liberals, or rather heretics — people to whom opinions are really secondary and to whom conviction and sincerity is, if anything, amusing. No other sort of person treats the faith once delivered to the saints, by which we live, and by which we will die if necessary, as something that can just be modified as seems convenient under cover of the sort of stale rubbishy phrases about “enrichment” (=change) or “diversity” (=change). By “evangelical” I suspect that they meant only the incidental cultural things that tend to be associated with what used to be called Low Church. There was certainly plenty of the lazy sloppiness in arrangements, the overrunning of time, and the over-mateyness that is too common among Christians these days. But that, to them, was I fear all that “evangelicalism” meant. A certain Rob Bell, who has been accused of universalism, was mentioned approvingly, and the criticism he has received mentioned with a smile. This, again, is not bible-based Christianity. Any group that is centred around an ideology or a set of principles — rather than a social group — must define itself, in order to exist. It must define what it is, and what it is not. The attitude I found there was one of pure liberalism. The Fathers were men. Much of what they say is tosh, as is the case for all of us. You don’t add the Fathers to the biblical teaching. They may illuminate it for us, they may have interesting things to say or examples to offer; but at the end of the day they are not inspired. I walked back down the Banbury Road afterwards, rather annoyed to see the Fathers being hijacked in this way. It is useful, however, to know that the term “evangelical” in patristics means nothing. What I did think, however, was that I ought to write an article on the Right use of the Fathers. Indeed I think a book of that name exists somewhere. Because using the Fathers to deconvert Christians into Churchianity is NOT what I do, or want to see. I got back to my room, and decided that I would go to the organ recital this evening, from 8:30-9:45. 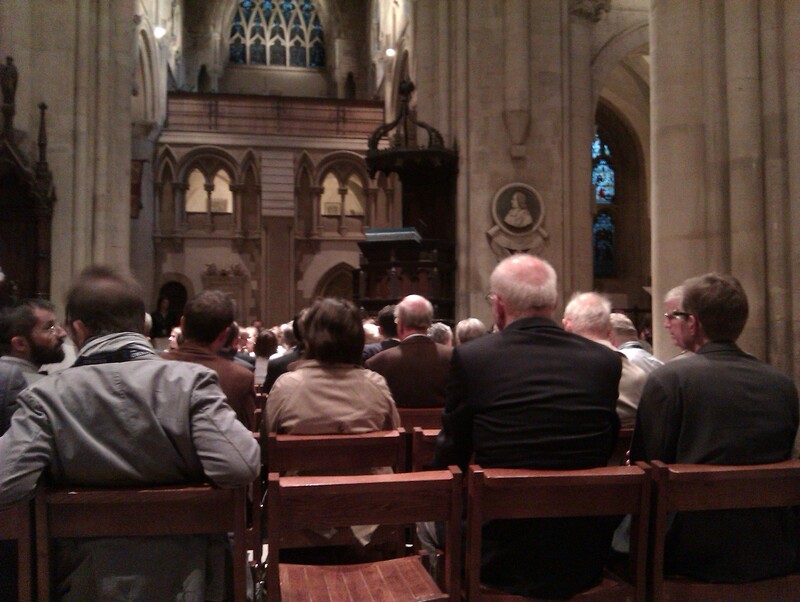 The theme was Bach and his influences, and it was held in Christ Church Cathedral. It was getting dark as I set out. 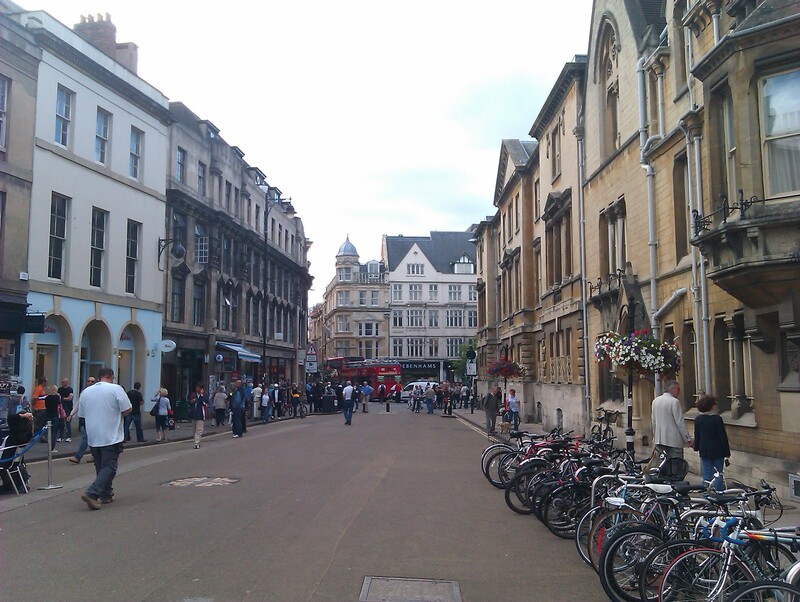 In the evening Oxford becomes a different place, warm, inviting, with restaurants everywhere. But the staple student emergency food, in my day, was provided by some mobile vans that appeared after dark. These served beef-burgers — at least, it was supposedly beef — with lots of onions and greens, and were generally known as the “death burger vans” and supposed to serve rat meat. Hygiene was probably a word that the owners could not spell. 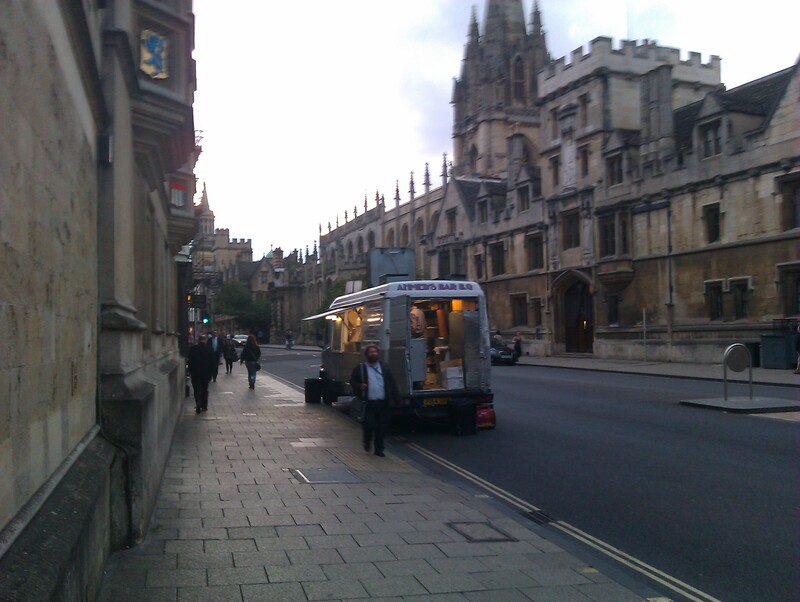 I was amused to see, in Oxford High Street, the modern version of the same thing, offering kebabs etc. I hope the standard is better. The recital was, in truth, tedious. The pieces by Bach were good, but I did not find the rendition of them particularly inspiring, and the other pieces were dirge-like. One, indeed, I could not help feeling was being misplayed, unless that composer really did introduce wavering notes and uneven intervals. We exited with what I felt was probably relief all round. I found myself following the distinctive figure of T. D. Barnes down the High Street from Carfax. A side alley contained a sign “Carfax chippy”. Well do I remember that dubious fish-and-chip shop where — personal experience — washing the potatoes before chipping and frying was optional. It was still in business, amazingly. Then back to the college annex. It’s been a good day, and the room is quiet now. Here’s hoping for sleep! 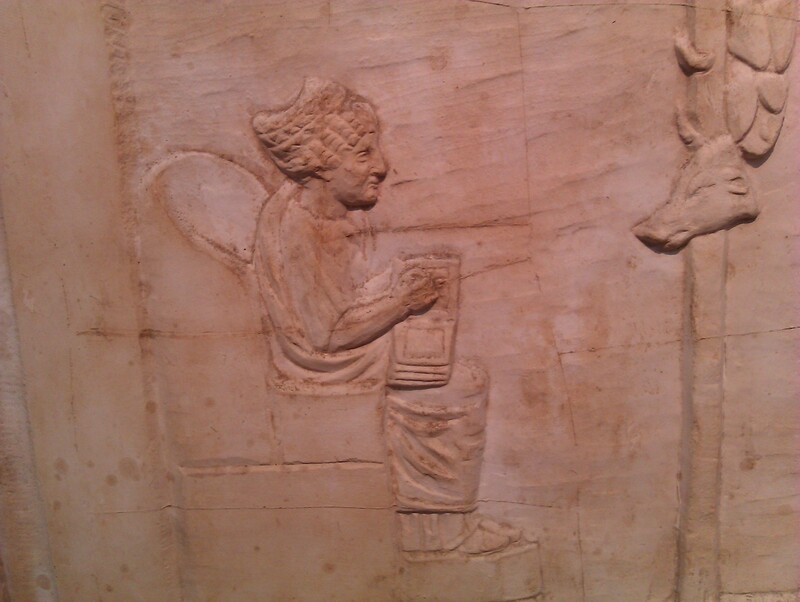 I then went to hear Hugo Lundhaug talk about Origenism in 5th century Upper Egypt: Shenoute of Atripe and the Nag Hammadi codices. This was fascinating, and discussed two texts. The first was a letter from Dioscorus of Alexandria, telling people — and Shenoute in particular — to hunt out heretical books associated with Origenism and other heresies in the monasteries of Panopolis. The second was a text by Shenoute himself, which does not mention Origenism but likewise is interested in books. Dr L. made the interesting point that we find in the Nag Hammadi codices, gnostic as these are, ideas which we associate with Origen, and the Origenist disputes, such as the spiritual resurrection and the pre-existence of souls. These apocrypha, then, such as the Gospel of Philip, could be held and used by people holding Origenist views, rather than being gnostics as such. Indeed we may suppose that the texts may have been revised at this period with these ideas in mind. I must write to Dr. L. and ask him for specifics on these two texts, which I think we would all find useful, as a possible literary and physical context for the Nag Hammadi codices. Then it was off to Room 1, up rather a lot of stairs, and much too close to the book exhibitions in the North School, to hear William Tabbernee present a most interesting paper on bishops exiled to Pepuza by Constantius II, including Hilary of Poitiers, and so forced to live among the Montanists and potentially to seek bread from the latter. Dr. T. very sensibly gave us the text of his article, with footnotes, which indicated the evidence — some from Hilary’s In Constantium. He finished with photographs of the Pepuza area, which he excavated. Let us hope that he and his team can return. That was enough for me for the morning. I wandered into the North School, where I enquired about the Gorgias dictionary, and met one of my old transcribers of Syriac at the Gorgias stand. I was forced to apologise for my poor memory, and I hope no-one that I have corresponded with will be offended by what is a physical failure, rather than any rudeness. Then, fataly, I went to the Liverpool University Press stall and spent money. Oh no! Yes, I actually bought books: Theophilus of Edessa’s Chronicle; Selected Letters of Libanius; and Antioch as a centre of Hellenic culture. These three totalled £35. The only difficulty is where I shall put them at home! I detoured back via my own stall, where I discovered that some careless person had messed up the display — which I fixed — and then back here. There’s quite a few sessions this afternoon. But first, I have some emails to write! Between 10:20 – 11:20, I spent my time in the marquee at my stall. I arrived to find that a group of Russians with a film crew had positioned themselves with a table right in front of my table, thereby preventing anyone from visiting it. Promises that they would not be long proved empty. By dint of rearranging I was able to get the table at least partially accessible. I’d brought my laptop, and typed up a diary. I sold a paperback there, and, interestingly several visitors picked up a copy of the leaflet, apparently oblivious to the fact that they had one in the welcome pack. But my presence there brought one dividend; David Michelson, whom I had missed earlier, appeared and we talked about his new project for an online Syriac dictionary of people and manuscripts. It’s all database driven, he has plenty of staff. The latter will be publishing an Dictionary of the Syriac Heritage, by Sebastian Brock and van Rompay, which will be less than $100, and sounds like an essential purchase. Meanwhile I was trying to set up Microsoft Expression Web on my PC, which I had bought by download this morning. It refused to start, so I didn’t get anything done. But it turned out that this is a known clash with Kaspersky anti-virus. There was no Wifi in the Examination Schools — a very strange omission — so I didn’t find this out until later. But I did get a call from Gemma at Queen’s to the effect that there was now a room I could change to (room 12 in the Queens Lane Annex) and I promptly did. There is still some noise, but much less, and I hope to actually get some sleep tonight! I was very pleased by this, as you may imagine.